Justice Minister says Netanyahu's proposed law isn't the solution, calls to give ethics committee more power, disqualify Balad party. 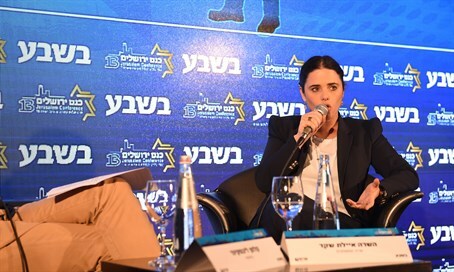 Justice Minister Ayelet Shaked (Jewish Home) spoke at the 13th annual Jerusalem Conference about Prime Minister Binyamin Netanyahu's proposed suspension law, proposed in response to a visit by Arab MKs to the family of terrorists. Shaked stated that she isn't against the suspension law, but that she feels it does not provide a proper solution to dealing with MKs such as Zoabi and Ghattas. "I am not against it, I just don't believe that it is a solution to the problem. There is an article in the law that we should use to disqualify any MKs who negate the existence of Israel as a Jewih and democratic state," Shaked noted, referring to Israel's Basic Law: The Knesset, Chapter 7A. The Jewish Home minister further observed that the Knesset Ethics Committee could have imposed a slightly longer ban - and should be empowered to go further still. "The ethics committee can suspend an MK for a maximum of up to six months. MKs Ghattas and Zoabi have been suspended for four months. I believe that we need to give the ethics committee the ability to suspend an MK for up to a year." According to the Justice Minister, a party such as Balad that negates the existence of Israel as a Jewish and democratic state should not be allowed the privilege of running for the Knesset. "I believe that we need to change this before the next set of elections. The election committee should have disqualified her [Zoabi] from running." Responding to comments that the law should be used against her as she had met with family members of accused Duma arsonist, Amiram Ben Uliel, Shaked responded and said that the meeting she held with the family members was part of her responsibilities as Justice Minister as the family claimed that the rights of their son had been violated. "As a public representative, I need to be available to the public, and even more so as a Minister. I do not need to send them to bureaucrats." Shaked's meeting with Ben Uliel's family occurred before he was indicted for the crime - unlike the visit by Arab MKs, who met with the family of a terrorist shot dead in the process of carrying out a deadly attack in broad daylight.